Leicestershire Police is promoting diversity and tolerance with a poster and video campaign that depicts its staff transforming when they change out of what they wear on duty and into their off-duty, alternative garb. 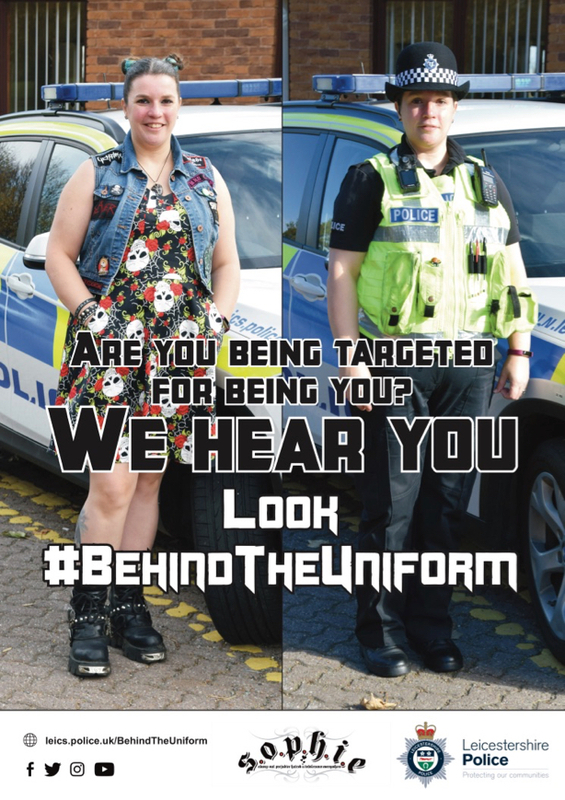 Dubbed #BehindTheUniform, the campaign is intended to stress that despite their working uniforms, police officers understand first-hand what it is to like to be part of a subculture, such as that of punks, goths and emos, and that they take hate crime seriously. Created in-house, launched at the end of last week and driven in the main by an officer who dresses 'alternatively', the campaign's core is a series of posters and videos. Each execution uses real staff members picked to represent the alternative community due to the way they dress and the lifestyles they lead outside the workplace. 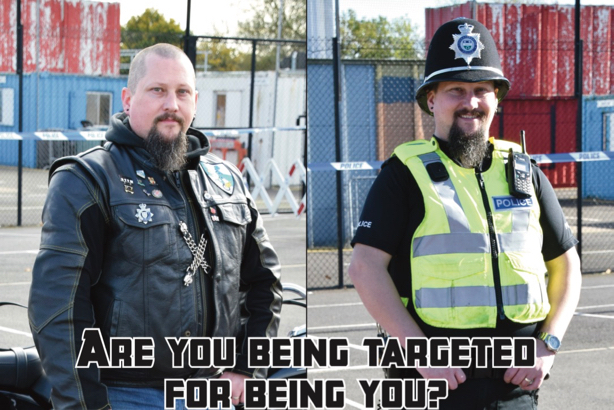 Starring two officers from Leicestershire Police and two from Lincolnshire Police, each of the videos asks: "Are you being targeted for being you? ", adding: "We hear you. Look #BehindTheUniform". One video shows Leicestershire Police contact handler and special inspector Matt Ablewhite dressed in his regular office garb entering the workplace. He is then seen leaving the building dressed in rocker-style gear. The second video opens with PC Nick Reeve in uniform, before he removes his police helmet and the shot dissolves to one showing him in his biker leathers. He then puts on his bike helmet and mounts his motorbike. Another video shows a policewoman entering a patrol car dressed in uniform. It then cuts to her exiting it wearing her 'alternative' attire. Finally, "Remember, don't judge a book by its cover" depicts a similar sequence of events, with a man entering a building in work clothes and leaving dressed in biker boots, customised sleeveless denim jacket emblazoned with patches, and black jeans with a long silver key chain. Leicestershire Police admitted that the nature of the ongoing campaign made it hard to measure for effectiveness, but that it hoped it would raise awareness and change people's attitudes and behaviour. Ablewhite, who has driven a lot of the work on the comms push, said: "The idea for this campaign has always been focused on the message 'don’t judge a book by its cover' and that serving officers and police staff classify themselves within this community. It also demonstrates that we as the police will recognise, assess and understand the impact that subculture hate crime has on its victims and the wider community and that we will provide necessary support and advice where needed. "Identifying myself as being a part of this community, coupled with my roles within the police, means I feel strongly about raising awareness around alternative subculture hate crime reporting." Leicestershire Police became the ninth police force to add alternative subcultures as a category of hate crime, in November 2015. The campaign includes the Sophie Lancaster Foundation's S.O.P.H.I.E. campaign branding. This August marks the 11th anniversary of the murder of Sophie Lancaster, who, alongside her boyfriend, was attacked in a Lancashire park by a gang of teenage boys for wearing goth-style clothes.